Research by UC Davis psychologists indicates that hate crimes based on sexual orientation have more serious psychological effects than other crimes. According to Dr. Gregory Herek, Professor of Psychology and Principal Investigator of the 4-year study that was funded by the National Institute of Mental Health, lesbian and gay survivors of hate crimes during the previous 5 years showed more signs of psychological distress  including depression, stress, and anger  than did lesbian and gay survivors of comparable non-bias-motivated crimes in the same time period. All victims of serious crime are at risk for such distress, but the problems associated with hate crimes appear to last longer than for random crimes. In Dr. Herek's study, crime-related psychological problems dropped substantially among survivors of non-bias crimes within approximately two years after the crime. Hate crime victims, however, continued to have higher levels of depression, stress, and anger for as long as 5 years after their victimization occurred. Many of the problems observed by Dr. Herek's research team may result from hate crimes victims' feelings of personal danger and vulnerability associated with their identity as a gay man or lesbian. All crime victims are likely to feel more vulnerable after their experience and to perceive the world as more dangerous, unpredictable, and hostile. Dr. Herek's data suggest that hate crime victims, in addition, often link this sense of vulnerability and powerlessness to their gay or lesbian identity. This association can be psychologically harmful because sexual orientation is such an important part of the self-concept. High Risk For Crime and Harassment The survey showed that hate crime victimization is a serious problem in the Sacramento (CA) area. Nearly one-fifth of the women and more than one-fourth of the men in the study had experienced a crime or attempted crime based on their sexual orientation at some time in their life. One woman in eight had been victimized in the previous five years; one man in six had been a hate crime victim in that period. The types of victimization included assaults, rapes, robberies, thefts, and vandalism. In addition to their risk for hate crimes, Sacramento-area gay men and lesbians also routinely face other kinds of harassment. In the year prior to the survey, more than half of the respondents had been the target of antigay verbal abuse. Nearly one-fifth had been threatened with violence, chased, or both. 16% of the respondents reported that they had been the targets of employment discrimination  either in hiring, firing, promotion, or treatment in the workplace. Nearly 2300 gay men, lesbians, and bisexuals from Sacramento and surrounding areas participated in the research, which was directed by Dr. Herek, Dr. J. Roy Gillis, and Dr. Jeanine Cogan. The sample included nearly equal numbers of men and women. 83% of the respondents were gay or lesbian, with the other 17% describing themselves as bisexual. The median age of respondents was 34 years. Research respondents completed a lengthy survey that included questions about their experiences with crime, their health and social activities, and a variety of psychological measures. In addition, approximately one-fifth of them were interviewed at length about their experiences. The study's main findings were published in the Journal of Consulting and Clinical Psychology (1999, volume 67, #6, pp. 945-951). The abstract of that paper, as well as directions for ordering a reprint or downloading a preprint, can be found elsewhere on the site. 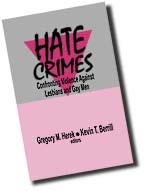 Download a preprint of the paper, "Psychological Sequelae of Hate Crime Victimization Among Lesbian, Gay, and Bisexual Adults," which was published in the Journal of Consulting and Clinical Psychology in 1999. Download a 2-page summary of the study's findings, similar to the handout distributed at the 1997 White House Conference on Hate Crimes. Download the portion of the questionnaire (men's version) with items about violence, crime victimization, and discrimination. (Requires Adobe Acrobat reader, version 5, which can be downloaded free of charge). Information about Dr. Herek's national survey on hate crime victimization.